As I have mentioned many times before, Spud and myself are big Disney fans, when doing Spud's bedroom last year, we searched high and low for a Mickey Mouse mid-sleeper bed but unfortunately had no joy, instead he settled for one of his other Disney favourite's Toy Story! The Toy Story Flight Control Buzz Lightyear is a luxury step up from the standard Buzz Lightyear Spud has, before Littlewoods very kindly sent us this toy for review, all Spud had was a Buzz Lightyear plush we won out of a arcade machine whilst on holiday a few years ago. Spud's new friend Buzz is a talkative fello as you will all know from the 3 Toy Story films. Flight Control Buzz Lightyear lives up to this reputation with more than 50 phrases and sounds effects ready to hurl at you. Spud kept pretending to be asleep! 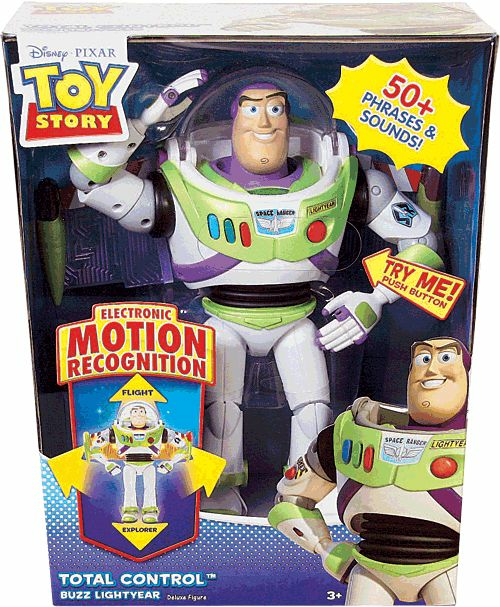 With motion sensors Buzz knows when you are hurling him up or down, he lights up, makes noises and much more. With posable arms, legs and a movable helmet this new Buzz is something for all Toy Story fans of all ages! Toy Story Flight Control Buzz Lightyear is suitable for ages 3+ and is available to buy from Littlewoods for £59.00. Not only do Littlewoods do the fantastic Buzz we was sent, they also do many more Toy Story toys, hundreds of toys actually, make sure you check out the toy section! To find out more about Littlewoods visit the official website here, find them on Facebook here or follow them on Twitter here.